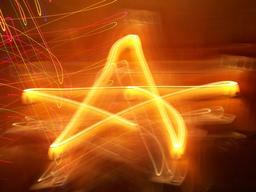 here is a simple feedback based light painting example. it is made to emulate the effect of opening up your exposure on a camera. you will want to mess with the feedback level and after image life settings to paint. results will vary with room lighting and what not. this is a simple example. you may want blend the original image with the feedback image based on motion detection or something. or maybe threshold and blur the feedback image and use it as mask with the original image to get more clear image where the streaks are not. as it is the effect is applied to the image as a whole. if you get a white screen when you open just back the level off till you see your self then bump it back up and start painting with a lighter or led. very good, master !!! excellent !! busted !!! wow !! Slick, dust! Very nice. Thanks! thanks guys. i take it is working then. i waited till last night was dark to try it but my webcam looks like poop in the dark and was getting better results in the light. Using a simple blue LED torch , also have a red and a green one too, must put them to use sometime :-). Love the spectral and chroma like effects. I'm just beginning to get back into a whole load of Kineme and other 3rd party plugins, which I've been enjoying a re-introduction to following a long sojourn over to OpenCL land. Just beginning to get used to some of them that I've hardly ever used to any great extent at all. Can we track and use that graffiti and style from those light paints using CV Tools & 'recycle' them? yeah totally possible with things like ccv and bbtouch + tuio + qc... not sure if its possible in solely qc until someone makes blob tracker. either way you would want to track a clean (non feedback) image preferably with a ir led and modified webcam. then queue up some of the coordinates and feed them into a gl line structure, then apply a glow effect and feedback to the line segments to get a similar effect to light painting. i have been meaning to make a recording of something like this with ir lasers taped to my fingers. also been meaning to see if i can make blob track plugin with ofx-qc. I'll have to give that a try a little later. Still busy tonight rendering video / audio & uploading the same. Very cool Dust. I just know audiences will love playing with this. Thanks for sharing. Nice, I love playing with stuff like this. Points or "stars". A la star wars. How to ?